The Dominique is said to be America’s oldest chicken breed. It was brought to the United States by settlers and helped them to survive the brutal first years of colonization. They were used as a dual purpose hen and even their feathers were used to stuff pillows, truly a multi-purpose hen. Unlike our present day hens, they were not spoiled at all, indeed, they had to provide for themselves and exist on what they could find when roaming. There are several theories about the origins of the Dominique. It was said to have been brought to America by the Pilgrims, hence their original name: Pilgrim fowl. It was also rumored to have come from the French colony of Saint Dominque in what is now Haiti. The name Dominicker comes from this story. Other names for this bird have been: Blue spotted hen; Old grey hen; Pilgrim fowl, Dominic and Dominicker. It is likely we will never know the exact origin and lineage of this bird, but we do know it was indispensable to the early settlers as it was a hardy little bird that foraged for its existence. Without a doubt it is the oldest American breed of chicken being known to settlers in the eastern US since the 1750s. The original Dominique was both single comb and rose comb; folks didn’t pay much attention to ‘standards’ back then. It was the New York Poultry Society that decided the Dominique should be rose combed and set out to create the standard for this breed. The Dominique has had periods of high popularity and periods of near extinction during its career. The first period of decline was in the 1920s where it survived the Great Depression and the 1st World War. Many small farm folks kept the Dominique because of its’ thriftiness and hardiness. The second crisis came when the poultry industry became mechanized and industrial. The Dominique, like many other breeds was deemed ‘not productive’ enough for the commercial industry and a slow but steady decline started. By the 1970s only four breeding flocks were known to exist. The American Livestock Breed Conservancy convinced the flock owners to participate in a breeding program in order to save the Dominique. 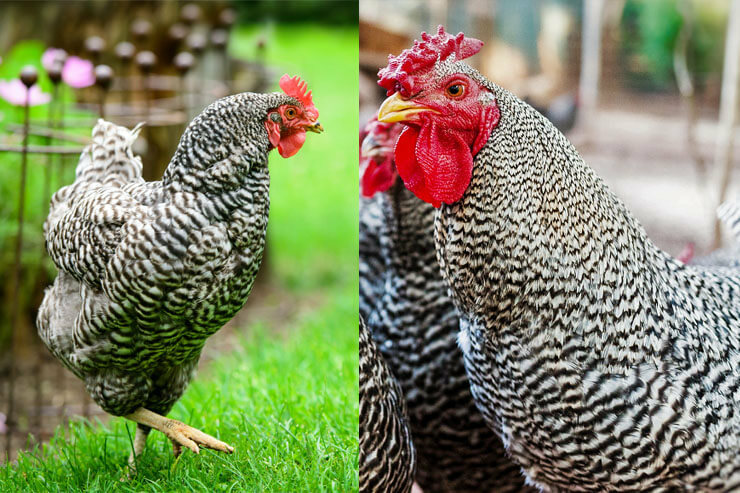 Spotting the difference between a Barred Rock and a Dominique is all in the eye! First and foremost, the ‘tell’ is the comb. Barred Rocks have an upright single comb; Dominiques have a flattened cushion comb, called a rose comb. The rose comb comes in very handy in cold Northern climates since they are resistant to frostbite. A true rose comb will have a ‘leader’ – this is a slightly backward facing spike at the back end of the comb. The second ‘tell’ is the barring – the Barred Rock has crisp, black and white barring with a high contrast on the black and white. Whereas, the Dominique has a more staggered barring or cuckoo pattern, the contrast between the black and white is very low key with the feathers being black/slate and the white being white/off white. The comb, wattles and earlobes are all red, indicating in this case a brown egg layer. The beak is short and quite stout and yellow/horn in color. Eyes are reddish bay color. The Dominique is a well-rounded bird, the back being of medium length and moderately broad. The back is concave in shape rising up to the tail which is carried at a 45 degree angle. The wings are quite large, but always neatly folded. The breast is round and full. The hackles, saddle and sickle feathers on the boys are usually long and well curved. Legs are short and stout, clean feathered and yellow in color. There are four toes to each foot. Prior to 1870 there was no written standard for Dominiques and because of this there was much uncertainty about what made a ‘good’ Dominique. At this time, many birds called Dominiques had single combs and other ‘impurities’ for the breed we now know as Dominiques. 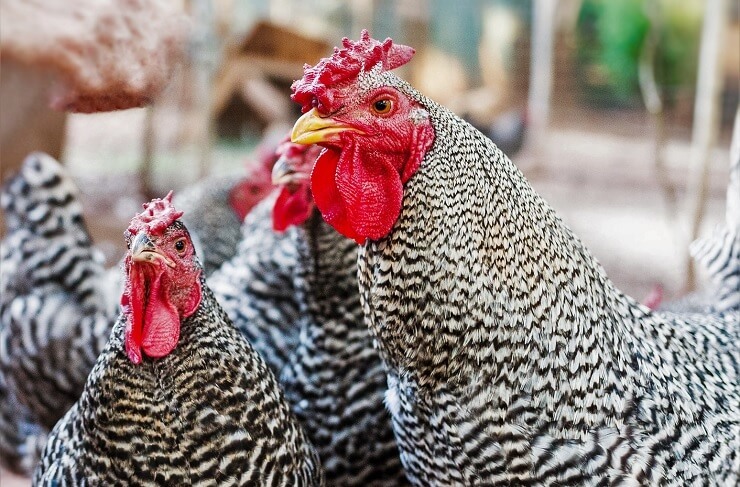 At the end of the 1870s, the New York Poultry Society decided to clear up the confusion over the breed. The standard was drawn up that stated Dominiques should have a rose comb, all other hens were considered to be Plymouth Rocks. Essentially, if the bird had a rose comb it was a Dominique and if a single comb it was a Barred Rock. This caused a certain amount of uproar among breeders and the standard was redrawn several times, but in 1914 a standard was implemented that everyone could live with. At least a small part of the dissent was probably created by those crafty individuals who exhibited single comb in both the Dominique and Barred Rock categories in order to gather more points! 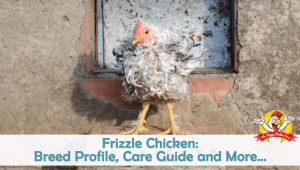 Sweet, gentle, calm and docile – all apply to this little hen! I have never met a Dominique that I didn’t like. They are friendly, often following you around for treats. The chicks will be friendly too and gather around your feet so you need to take care not to step on them! Dominiques are steady and dependable hens that like to forage if allowed to, but will do well in confinement too. 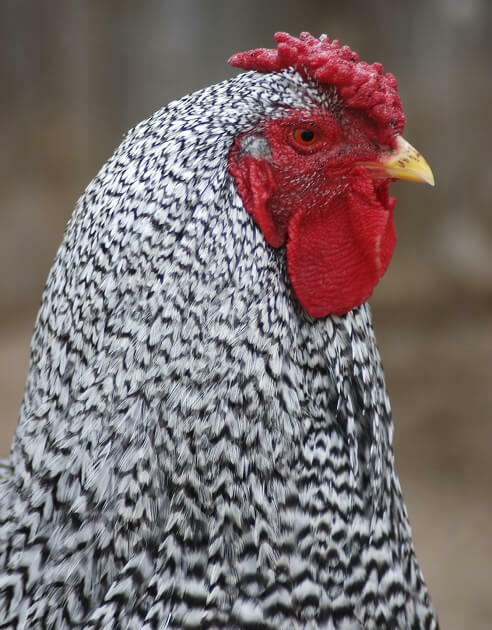 The roosters can be aggressive especially around the mating season but in general are not aggressive to their keepers. When grown, the males will weigh in around 7lb and the females at 5lb. There are bantam Dominiques available and they weigh 28oz for the males and 26oz for the females. These hens lay a medium sized light brown egg. They can lay between 230-270 eggs per year which equates to roughly 3-4 eggs per week. Today’s Dominiques are said to occasionally be broody, but they must have been broody back in colonial times otherwise they would not have endured this long! Mothers are known to be very good mothers, attentive to their chicks. They also have a high rate of success in raising their brood. The Dominique chicks are auto-sexing, so are easy to classify at hatching. Dominique chicks have whitish head spots. In the females the spots are usually small and concentrated – the male spots are more diffuse and scattered. The second way to tell is that the males will have dark yellow/orange legs; the females will have burnt orange/brownish legs. This method is not as reliable as the head spot, especially if comparing different strains of bird. Is the Dominique Right for You? The Dominique is a very good choice for a family flock as they are gentle and non-aggressive. An excellent choice for children; although not a ‘lap chicken’, they don’t seem to mind being picked up and carried around. If you have some assertive breeds in your flock, you will need to keep an eye open for any bullying that might be directed at the Dominiques. They would do well in a flock of similar gentle natured birds such as Cochins, Orpingtons and Polish. 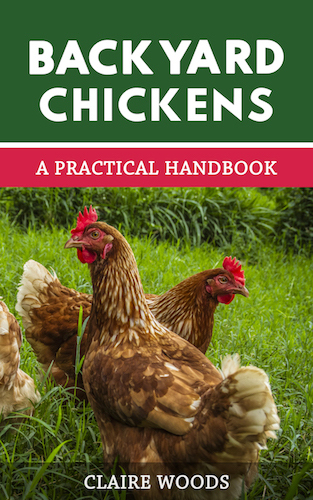 They really are a low maintenance breed and quite self-sufficient, so very suitable for first time chicken keepers. An added bonus is that they are fast growers too. They also ‘show’ well because of their calm demeanor and tolerant attitude. This makes them a good hen for young farmers and a 4H project. The Dominique is a robust and hardy bird with very little in the way of health issues. It has a rose comb so is not troubled by cold temperatures causing frostbite. As with all birds, parasites will need to be kept in check. Although breeding programs have been successful, the numbers of Dominique chickens worldwide remains very low. 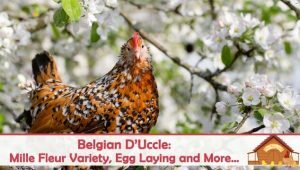 With the recent interest in backyard chickens and sustainability, the Dominique is well suited as a homesteader hen. They can free range for most of their food, are low maintenance, and produce enough eggs for a family. We hope that you have enjoyed this little American gem and will consider adding them to your flock. 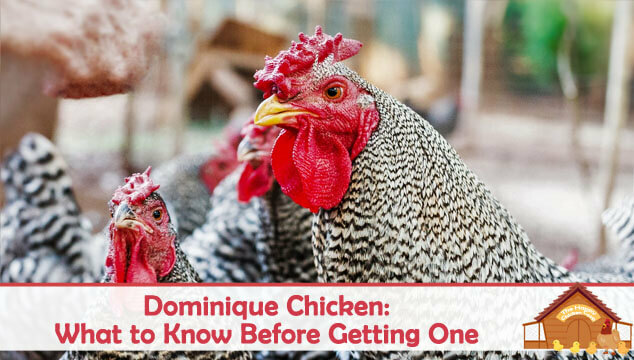 I have 10 dominique hens. Would like to know where I could get 2 dominique roosters. About 10 months old.